Pennsylvania�s Historic Bridges examines the development of different types of bridge structures across Pennsylvania through the world of postcards, many of which are from the early 1900s. The structures featured are constructed from various materials and in a multitude of styles. 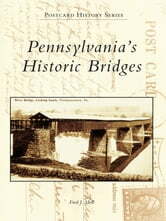 Also found within these pages are several postcards of pedestrian bridges, canal bridges, trolley bridges, railroad bridges, and an aqueduct.